NASA's space shuttle Enterprise, seen here during a test flight in 1977, was added to the National Register of Historic Places in March 2013. 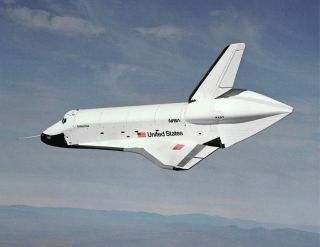 The Enterprise, NASA's original prototype space shuttle, is now more than just a historic spacecraft. It is a historic place, too. Located at the Intrepid Sea, Air & Space Museum in New York City, the test orbiter has been added to the National Register of Historic Places, becoming the first of NASA's retired space shuttles to receive the distinction. "We are extremely proud to be the home of the space shuttle Enterprise," Susan Marenoff-Zausner, president of the Intrepid, said in a statement. "It is an honor to receive this distinction from the National Park Service." The National Register of Historic Places is the official list of the United States' properties that are considered worthy of preservation. Authorized in 1966 as part of the National Historic Preservation Act, the register is part of a national program to coordinate and provide support for public and private efforts to identify, evaluate and protect America's historic and archeological resources. Prior to landing in Manhattan, Enterprise was displayed by the Smithsonian at the Steven F. Udvar-Hazy Center, the Virginia annex to the National Air and Space Museum. Enterprise's exhibit on the Intrepid's flight deck debuted to the public in July 2012. Its environmentally-controlled, air-supported structure was open for only three months when Hurricane Sandy damaged the pavilion beyond repair. The shuttle also sustained minor damage to its tail. A protective cover and scaffolding was erected above and around Enterprise to assist with the repairs to the orbiter. That temporary shelter was being taken down this week, revealing the repaired Enterprise in preparation for a new display structure to be raised around it. The new space shuttle pavilion is expected to open to the public in early summer. "We look forward to creating an exciting showcase of the extraordinary history of Enterprise, so that it may continue to educate and inspire the next generation of innovators for years to come," Marenoff-Zausner said. The Intrepid's application for Enterprise to be considered for the National Register of Historic Places was prepared in September 2012, with letters of endorsement from New York Senators Charles Schumer and Kirsten Gillibrand, as well as Congresswoman Carolyn Maloney and astronauts Robert Crippen, Fred Haise and Richard Truly. "I am pleased to offer my support for a nomination of the space shuttle Enterprise, OV-101, to the National Register of Historic Places," wrote Truly, who served on board the USS Intrepid as a naval aviator before being selected as a NASA astronaut and piloting Enterprise. "I am proud to be one of only four astronauts to fly this historic spacecraft and I can personally attest to its historic significance." Enterprise was granted Historic Place status on March 13. Enterprise is not the only structure from space history to be listed in the registry. The iconic large countdown clock and flag pole located at NASA's Kennedy Space Center in Florida were granted Historic Place status as a combined entity in 2000. In addition, the Saturn V rockets on display in Houston, Texas and Huntsville, Ala. are both registered structures. Since its creation in 1966, more than 1.4 million buildings, sites, districts, structures and objects have been added to the National Register of Historic Places, providing a link to the United States' heritage at the national, state, and local levels. Follow collectSPACE on Facebook and onTwitter at @collectSPACE. Copyright 2013 collectSPACE.com. All rights reserved.